If you’re in middle Tennessee like me you are having some very wet weather; farther north you may have snow or ice. I’m sure similar weather is playing out in all parts of the northern hemisphere and our friends in the southern hemisphere are in the midst of summer. Whatever your weather, now might be a good time to look at some gorgeous photos of daffodils. The ADS Show Winners 2018 PDFs are now posted on Dafftube.org. 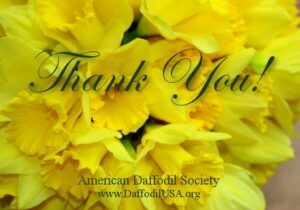 The two files are collections of photographs of ADS award winning exhibits at the 2018 daffodil shows in Livermore CA, Murphys CA, Roswell GA, Fortuna CA, Knoxville TN, Nashville TN (the 2018 National show), Indianapolis IN, Cincinnati OH, Washington PA, and Niles MI. The 245 slide presentation is available in two versions. In one version you advance from one page to the next manually. The other version is self-playing (under Adobe Reader) by automatically advancing from one page to the next. Both have exactly the same content and both are PDF files. If you are not familiar with PDF, click on the “About PDF” link in the sidebar to the right. A special thanks to our two amazing ADS photographers, Kirby Fong and Tom Stettner, for all the time and energy they put into documenting these winning exhibits.